Each Line I Type In Microsoft Word2016 Is Having Numbers!!! How Can I Fix It? If as you type in Microsoft Word2016 and each line you type is automatically assign a number by Word2016, then you may have unknowingly activated the Line Numbering feature of Word2016. This is what you can do to deactivate it. Finally click on None from the menu that appears. 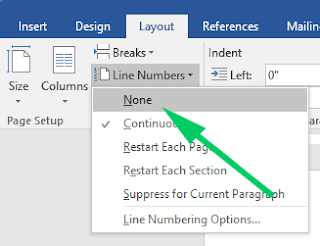 Do this will remove the Line Number currently in the document and will prevent/stop Word2016 from adding numbers to any text line you may type in the current document and in subsequent new documents. If this is helpful, then Join our newsletter or submit your email address below, because we have more helpful material to share with you. And you will get it only when you join our newsletter.